October is Adopt a Shelter Dog Month and I think Carley would make a good spokesdog. In 2007, when they were little puppies, she and her brother were surrendered to Dogwood Animal Shelter in Osage Beach, Missouri. Carley's brother was adopted quickly. 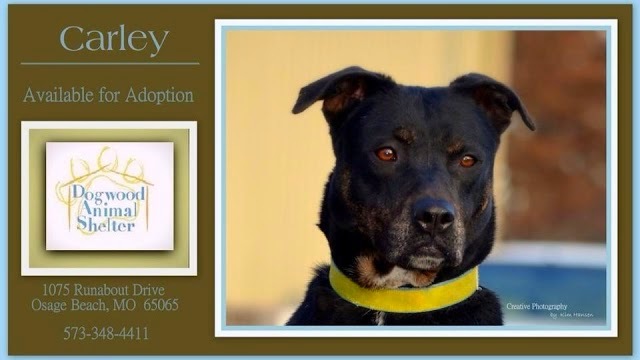 Carley was listed on Petfinder. She completed the shelter's obedience class. Shelter staff raved about her and said she was a fast learner and eager to please. 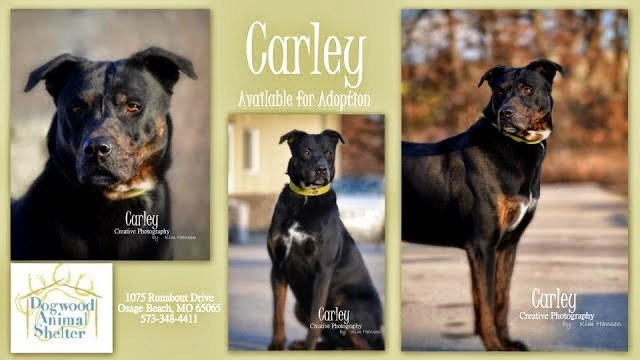 A professional photographer took some fabulous adoption photos of Carley in 2013. Carley's been shared on social media for the past 2 years. Still, no takers. Luckily for Carley, Dogwood Animal Shelter is a no-kill facility. 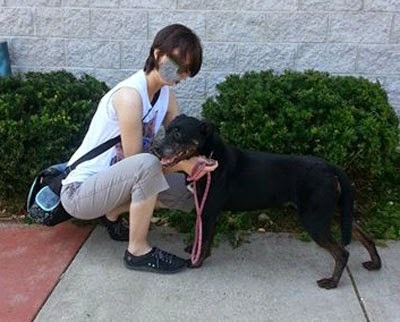 Carley waited 7 long years at the shelter. This past week Carley was adopted! getting ready for her freedom ride. Ashley adopted Carley's brother 7 years ago and lately has been taking Carley to her home for weekend visits. Just a couple of days ago, she made official. Carley not only now has a home, she's been reunited with her brother. 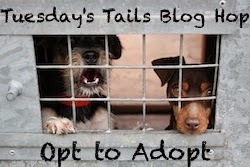 The best way to celebrate Adopt a Shelter Dog Month is to adopt a dog! Your local shelter is the perfect place to find dogs of every type, size, age and personality -- all waiting for a loving home. Or, if you prefer a particular breed that isn’t currently available at a shelter, go online to find a breed-specific rescue group in need of adopters like you. Find out what a shelter or rescue dog can bring to your life this October during Adopt A Shelter Dog Month! Oh that is so very wonderful and we are doing the happy dance for sweet Carley! I am so happy for Carley, her brother and her new human! Thanks for sharing the great news! This is such great news!! How exciting to go to her new home and reunite with her brother as well. Thanks for sharing this happy ending! Carley finds a new home after 7 years and gets reunited with her brother. What wonderful news! I remember Carley from the very beginning of Tuesday's Tails! So glad she was adopted! Yay Carley! What great news, so happy for her. I was thrilled to hear this. It's so wrong for a dog to spend it's entire life in a shelter. Yay for Carly!